Oxalis, also known as common yellow wood-sorrel, is a common perennial weed in lawns and gardens. Although it is invasive, it is quite easy to kill. Oxalis responds well to repeat spraying with post-emergent broad-spectrum herbicides. These herbicides work best when they are sprayed on oxalis during the growing season. The herbicide is absorbed more quickly during the warmer temperatures and more of the plants die sooner. Oxalis often invades lawns and gardens. Cover any nearby desirable plants with a plastic sheet. Broad-spectrum herbicides will kill any plants that they come into contact with. Spray the plant's foliage with a broad-spectrum herbicide until just before the point of run-off. Follow the manufacturer's instructions for application rates and amounts. Re-spray any surviving Oxalis plants in two weeks or at the interval recommended by the herbicide's manufacturer. Apply a spray or granular pre-emergent herbicide over the affected area in early spring. 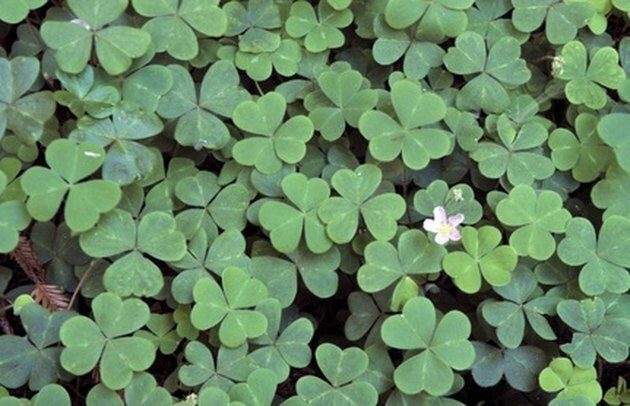 Oxalis spreads primarily by seed and each plant may produce up to 5,000 of them. If the adult plants are not killed before they set seed, you will face a new crop next season. Follow the manufacturer's instructions for application rates and amounts. Water the soil with an inch of water to help the herbicide penetrate the soil.